C Sánchez-Sánchez, J Fernández-Cavia (2018): “The perception of professionals and academics regarding the knowledge and competencies required by today’s advertising industry”. Revista Latina de Comunicación Social, 73, pp. 228 to 263. Introduction. 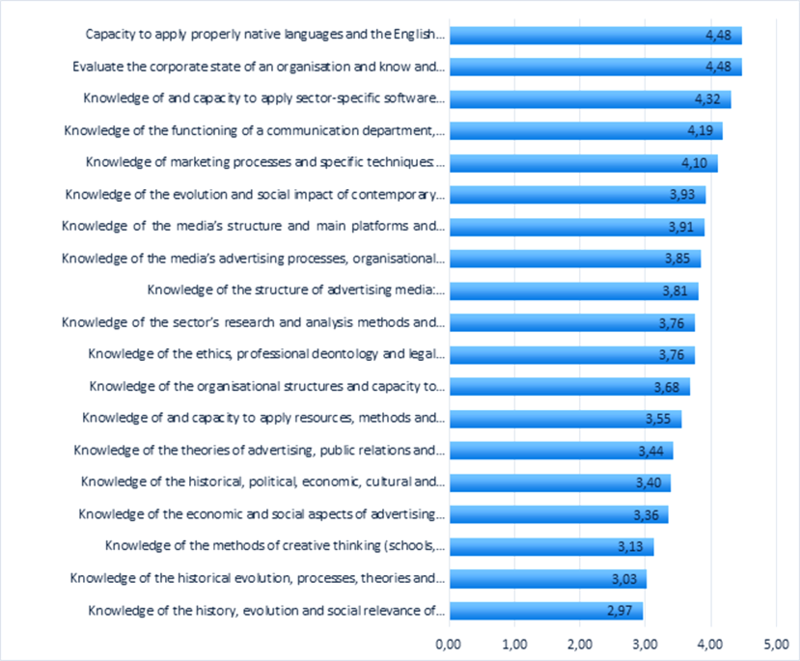 This research article provides a general map of the most important areas of knowledge and competencies for professionals and university faculty and managers from the advertising industry in Spain, taking into account the emergence of the Internet and new technologies as well as the apparent disconnection between the professional and academic worlds in this sector. Methods. The study is based on data collected by means of a survey questionnaire applied to a sample of 138 participants and interviews with 19 professionals and university professors and administrators from the advertising sector. Results and discussion. The specific competencies of the profession, such as those related to strategy, client relations and communication skills, are still perceived to be important, while those competencies related to the history and theory of advertising are perceived as not very important. Competencies related to autonomous learning, the ability to adapt to changes and expertise in the environment are perceived to be relevant. New competencies related to the knowledge to use specific software applications and new technologies also emerge as important. Advertising, Knowledge; Professional competence; Advertising professional; Professor; University manager. 1. Introduction. 1.1. Current panorama of advertising professionals in Spain. 1.2. Current panorama of advertising academics in Spain. 2. Purpose and contribution of the research. 2.1. Research objectives. 3. Methods. 3.1. Survey: design and sample. 3.2. Interview: design and sample. 4. Results. 4.1. General trends. 4.2. Disciplinary areas of knowledge (know). 4.3. Professional competencies (know-how). 4.4. Academic competencies. 4.5. Specific competencies. 5. Discussion of results. 6. Conclusions. 7. References. Current societies are immersed in a process of accelerated technological growth, which is sometimes considered as a Second Industrial Revolution or a Digital Revolution (Suárez Rodríguez, 2016). New information and communication technologies (ICTs) and especially the Internet have completely changed the Spanish media landscape. According to recent studies carried out in Spain by the Spanish Media Research Association (AIMC), the internet has a penetration rate of 70% (AIMC, 2017c, 2017d), and 42.6% of the population consume this medium more than 4 hours per day (AIMC, 2017a), which suggests a substantial change in the national media landscape in comparison to previous years. In addition, and in relation to ICTs, for 95.4% of people, the main device to use the Internet is the smartphone (AIMC, 2017b), which is an instrument of vital importance to understand new communication dynamics. Both ICTs and the Internet bring with them a socio-economic-cultural model where communication is the central axis that supports much of the social dynamics (Bellón Rodríguez & Sixto García, 2016; Sotelo González, 2016). Participation and interaction are fundamental characteristics of the network (Almansa Martínez & Martín Godoy, 2012) and involve a model of hyper-connected society (Perlado Lamo de Espinosa, Saavedra & Rubio-Romero, 2016), which has a direct influence on companies and the advertising industry. To begin with, there are consumers who are empowered by several reasons. On the one hand, access to information enables the building of a society that is sensitised and combative with respect to certain issues that are likely to generate social debate (Sotelo González, 2016). On the other hand, citizens have the possibility to spread their personal opinions at a massive scale and be more socially active (Sotelo González, 2016; Suárez Rodríguez, 2016), above all thanks to social media, which are the spaces for self-expression par excellence in the online environment (Kumar & Gupta, 2016). This also affects the communication space, since the new communication environment produces are a series of interactive dynamics related to co-creation, crowd-surfing and user-generated-content, which alters substantially the way of creating an advertising strategy (Kumar & Gupta, 2016; Martí Parreño, Cabrera García-Ochoa & Aldás Manzano, 2013). Secondly, there is a multiplicity of media that lead to the fragmentation and segmentation of contents (Suárez Rodríguez, 2016) and, therefore, of the audience (Martí Parreño et al., 2013). In addition, people actively select content according to their preferences and consume several media simultaneously (AIMC, 2017a), which requires more flexibility from companies to be able establish integrated communications through various media, platforms, contents and even disciplines and sectors (Bravo & Madinaveitia, 2015). Moreover, advertising effectiveness has declined precipitously in recent years (Garrido, Fernández-Fernández & Baños-González, 2014) due to an environment of extreme advertising saturation. Consumers “cannot, neither voluntarily or involuntarily, process the increasing number of daily messages: radio ads, printed ads, TV ads, and banners on websites, billboards in videogames, SMS advertising in mobile phones...” (Martí Parreño et al., 2013, p. 329). This fact is combined with consumers’ lack of trust in the advertising discourse (Perlado Lamo de Espinosa, Rodríguez Fernández & Saavedra Llamas, 2015). This loss of efficiency could also be related to the fact that consumers perform several tasks at the same time and constantly change between devices and media, making it more difficult to identify and maintain meeting points (Kumar & Gupta, 2016; Martí Parreño et al., 2013). Thus, we are faced with digital audiences who act as receivers and transmitters, who no longer only read, hear or receive messages, but also participate in the development, ranking and sharing of content (Río Pérez & Kaufmann, 2014; Kaufmann, 2015; Pérez Seoane, 2015). These audiences are selective and expect brands to act in accordance with this new system in which the way we communicate, relate, work and consume is different than the way it was prior to the emergence of the Internet and the rise of ICTs (Martí Parreño et al., 2013). Faced with this situation, the advertising industry should “take on the challenge of quickly opening new advertising avenues in the digital spaces; ultimately, reinventing commercial communication” (Corredor, 2011, p. 98). To do this, the sector must assume communication as a strategic area and establish spaces of interaction with people (Castelló Martínez, 2012; Durántez, 2015; Kaufmann, 2015; Martí Parreño et al., 2013; Sotelo Gonzalez, 2016; Toledano Cuervas Mons, Miguel San Emeterio & Grijalba de la Calle, 2016), and customise messages to promote affinity with consumers (Castelló Martínez, 2012; Kaufmann, 2015; Kumar & Gupta, 2016; Martí Parreño et al., 2013; Pérez Seoane, 2015; Schultz, 2016). The internet and mobile technology (among other ICTs) offer the opportunity to generate notoriety at reduced costs, segment and create ad hoc content and collectively measure in real time the results of a campaign and work with a large amount of data on consumers (Castelló Martínez, 2012; Kaufmann, 2015; Kumar & Gupta, 2016; Martí Parreño et al., 2013; Schultz, 2016), which could justify advertising investment growth in this medium and device both in Spain (IAB Spain, 2016; Infoadex, 2017) and Europe (IAB Europe & IHS Markit, 2017), in addition to the reasons previously stated. These circumstances involve a comprehensive reorganisation of work routines and organisational structures (Río Pérez & Kaufmann, 2014; Schultz, 2016; Suárez Rodríguez, 2016), and both companies and advertising agencies are immersed in a process of change in their business model to adapt it to this digital scenario or space of confluence, as Del Río Pérez & Kaufmann have defined it (2014). In fact, Kaufmann (2015), based on the work of Kemp and Kim, speaks of the “connected agency,” although he also highlights that currently advertising agencies seem to be slow, rigid business structures that oppose deep change. As advertising agencies and their services change, their professional profiles have also been questioned and subjected to profound changes to be able to face the new communication challenges (Miguélez Juan, 2015), as it may be the case with communication directors (Francés Renau & Miquel Segarra, 2016; Sotelo González, 2016), media planners (Castelló Martínez, 2012; Martín-Guart & Fernández Cavia, 2014), and strategic planners (Fernández-Cavia & Sánchez Blanco, 2012; Monge Benito & Echebarria Gangoiti, 2016), although all profiles have been influenced by this new media, social and technological system. New tech-based specialities and professional profiles have also emerged, such as the “community manager”, which has motivated several recent studies (see for example, Bellón Rodríguez & Sixto García, 2016; Castelló Martínez, 2010, 2012; Correyero Ruiz & Baladrón Pazos, 2010; Perlado, Ramos Rodríguez & Toledano Cuervas Mons, 2014), the social media manager (Bellón Rodríguez & Sixto García, 2016; Correyero Ruiz & Baladrón Pazos, 2010), the web analyst (Bellón Rodríguez & Sixto García, 2016), the SEO expert (Bellón Rodríguez & Sixto García, 2016; Castelló Martínez, 2012; Correyero Ruiz & Baladrón Pazos, 2010), the SEM expert (Castelló Martínez, 2012), the HTML expert (Castelló Martínez, 2012), and the online and digital marketing specialist (Perlado et al., 2014), among others. These new professionals must have cultural and technological education, but at the same time must be versatile and multipurpose. Thus, there begin to appear job positions that require competencies that, until now, were possessed by several professionals, such as multimedia knowledge, mastery of image and video, knowledge of digital tools, and the ability to write, record, and edit (Soler Rojas & Aguilar Gutiérrez, 2009; Suárez Rodríguez, 2016). So, after the emergence of new job opportunities, the field of action of graduates in advertising has widened, so it becomes necessary to improve the ICT training of professionals in the advertising industry in Spain (Correyero Ruiz & Baladrón Pazos, 2010; Núñez, García & Abuín, 2013). Several authors point out that the university is finding it difficult to cater to the changing needs of the market and the advertising industry (Correyero Ruiz & Baladrón Pazos, 2010; Miguélez Juan, 2015; Monge Benito & Echebarria Gangoiti, 2016; Ortiz Sobrino, 2009; Perlado Lamo de Espinosa & Rubio-Romero, 2009). The advertising industry must adapt quickly to the new communicative demands of consumers and, hence, of clients, but it seems that professionals are required to have new competencies that they did not develop at the university. A study of Basque advertising professionals, carried out by Monge Benito and Echebarria Gangoiti (2016), found out that for both students and employers the knowledge acquired during the degree is little functional and it is necessary to increase practical training. In addition, authors such as Corredor and Farfán Montero (2010) indicate that advertising agencies consider that graduates in advertising do not have the adequate training to respond to the demands of the sector within the scope of digital competencies. In fact, the analysis of the curricula of advertising degrees shows the lack of inclusion of digital content in core modules, compulsory and elective subjects (Castelló Martínez, 2012; Fondevila Gascón, Santana López & Rom Rodríguez, 2016; Sotelo González, 2016). This would mean that newly graduates in advertising enter the labour market without knowing the media environment in full and in depth. The recent expansion of training courses, postgraduate diplomas and master’s programmes specialised in digital and interactive marketing is also a symptom of the lack of training in this field in undergraduate studies (Castelló Martínez, 2012; Correyero Ruiz & Baladrón Pazos, 2010). Although there are some areas that maintain their relevance over time, such as strategic planning and creativity, it is necessary to adapt the contents of BA programmes to the new professional needs related to digital marketing (Monge Benito & Echebarria Gangoiti, 2016). These new professional requirements are not simply related to knowledge but, as intended in the European Higher Education Area (EHEA). Instead, the objective is to overcome content-based education and move towards a competence-based education, closely related to the professional profiles (Bolívar, 2008; Monge Benito & Echebarria Gangoiti, 2016; Ortiz Sobrino, 2009). Digital technology has mutated the bases of both knowledge and the know-how (Scolari, 2008), which means that it is not only necessary to know the new digital system, but also to know how to work in it. For this purpose, it is necessary to incorporate new technologies and the new tools of the web 2.0, such as transversal content within the new education plans. There are already some professors who have begun to integrate ICT in their subjects and in teaching innovation projects (Correyero Ruiz & Baladrón Pazos, 2010). As it has been observed, this new media, technological and social landscape and its consequences in the professional dynamics in the advertising industry are a concern shared by professionals and universities alike. This circumstance leads to a constant review of the trends in the professional sector to produce the curricula of bachelor’s degree programmes in advertising and public relations in accordance with the professional demands (Castelló Martínez, 2012; Correyero Ruiz & Baladrón Pazos, 2010). It is important to bring together the interests of companies to the University field and, in the opposite direction, to bring the research carried out in the university to companies (Vivar Zurita, García García, Abuín Vences & Núñez Gómez, 2011). In 2005, the National Agency for Quality Assessment and Accreditation (ANECA) of Spain published a White Paper that served as a guide to Spanish universities to develop the contents of BA programmes in communication and identify the key competencies needed in each profession, including advertising. However, twelve years after its publication and after the emergence of the aforementioned panorama, it is evident that it is necessary to explore how the sector has evolved since the publication of the proposal of ANECA. The research presented here aims to offer a description of the competencies needed in today’s advertising industry in Spain, taking into account the fact that the landscape has changed since the publication of the ANECA White Paper and after the rise of ICTs. To this end, two key groups are studied: advertising professionals and the academic sector, which are two key groups to lay the groundwork for the future of the profession, taking as reference the classification of competencies offered by ANECA (2005): Disciplinary areas of knowledge (know), professional competencies (know-how), academic competencies and specific competencies. This information contributes to a redefinition of the teaching plans of Spanish universities so that they can conform to the new needs of the advertising market. Research with similar purposes has been previously carried out, but has focused on specific territories, such as the Basque Country (Monge Benito & Echebarria Gangoiti, 2016), or specific professional profiles, such as the corporate communication professional (Perlado Lamo de Espinosa et al., 2016) and the creative director (Toledano Cuervas Mons et al., 2016). This study has a broader purpose that complements previous results in this area. Objective 1: Explore the most in-demand disciplinary areas of knowledge (know), professional competencies (know-how), academic competencies and specific competencies in today’s Spanish advertising industry. Objective 2: Explore the most in-demand disciplinary areas of knowledge (know), professional competencies (know-how), academic competencies and specific competencies among professionals from the advertising sector in Spain and establish the relationship between the identified changes and technological and educational environments. Objective 3: Explore the most in-demand disciplinary areas of knowledge (know), professional competencies (know-how), academic competencies and specific competencies among academics from the advertising sector in Spain and establish the relationship between the identified changes and the technological and educational environments. Objective 4: Identify differences and similarities between advertising professionals and academics, taking into account their preferred competencies and their perceptions about the technological and educational environments. Given the previous research objectives, it is necessary to apply a quantitative research method to obtain descriptive data (identify the most wanted competencies), and a qualitative technique to obtain explanatory data (relationship between most in-demand competencies and the technological context). These techniques are detailed below. The survey technique allows us to identify the most in-demand competencies in the advertising sector, both in general and for each of the groups under study in this article. The two key groups for this study are: individuals who exercise the advertising profession (hereafter “professionals”) and individuals engaged in teaching and education management/administration in the advertising field in Spanish universities (hereafter “academics”). Inspired by the survey carried out by ANECA (2005), the technique presented here is made up of four dimensions that match four areas of competence: disciplinary areas of knowledge (know), professional competencies (know-how), academic competencies and specific competencies. Furthermore, it contains items related to the occupation and tasks performed by respondents. Knowledge of and capacity to apply sector-specific software and new digital technologies. Capacity to program and optimise web pages (SEO and SEM). Capacity to learn autonomously and adapt to changes. Capacity to understand and interpret critically a complex communicative environment. Ability to search and manage information in a digital environment. Respondents were asked to assess the degree of importance of each of the competencies presented in the questionnaire with a Likert scale where: 1 is Not Important; 2 is Slightly Important; 3 is Moderately Important; 4 is Important; and 5 is Very Important. This survey was carried out through an online questionnaire. Professionals were contacted through 72 advertising agencies operating in Spain, and 23 schools and associations of the sector, both regional and national. University teachers and managers were contacted through 34 Spanish universities offering BA degrees in advertising or equivalent. The survey was conducted during April and May of 2017. Finally, the sample is comprised of 138 valid respondents, of which 115 are professionals (83.3%) and 23 are academics (18.12%). The data were analysed using Microsoft Excel. The interview is a technique that allows us to contextualise or explain some of the results found in the survey, since it allows us to understand how the situation is defined (Ruiz Olabuénaga, 2012) by both professionals and academics. Competencies necessary to exercise the profession. Competencies needed for the occupation. Perception of the situation of traditional and new professional profiles as a result of the ICT boom. Perception of the situation of BA studies in advertising and public relations as a result of the ICT boom. Usefulness of the competencies learned during the BA degree programme and detected changes. Communication director, researcher and strategic consultant in advertising and public relations. A total of 3 participants. Media researchers, planners and buyers. A total of 3 participants. Creative directors and designers. A total of 3 participants. Corporate communication managers. A total of 3 participants. The sample also included new professional profiles identified in previous research (see Sánchez-Sánchez, Fernández-Cavia & Roca-Cuberes, 2016), such as community managers (a total of 2 participants) and interactive designers (a total of 2 participants). Finally, the sample also included academics, with a total of 3 participants. The final sample consisted of a total of 11 women and 8 men with work experience ranging from 5 to 29 years. The interviews have been analysed with NVivo qualitative analysis software. The analysis of the survey applied to advertising professionals and academics indicates that in general terms all groups of competencies are positively valued by respondents. 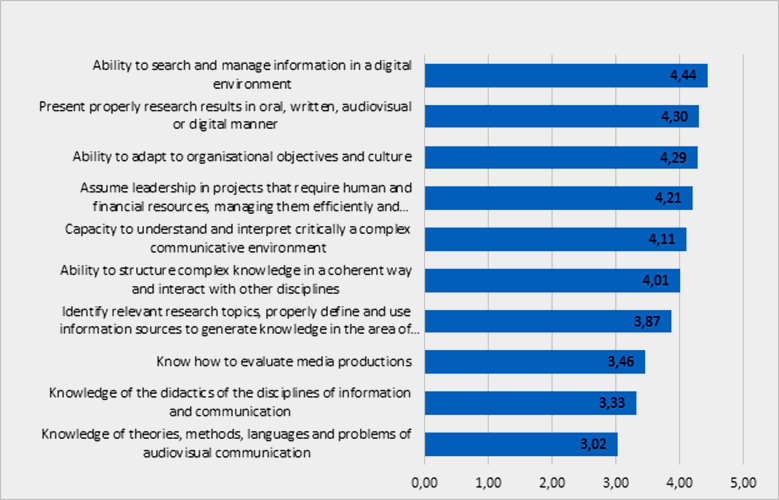 As we can see in Figure 1, the importance of all disciplinary knowledge areas, except for “knowledge of the history, evolution and social relevance of photography, cinema, radio, television and internet”, has been ranked as medium and high (average score of 3 to 5 in the Likert scale). Figure 1. Disciplinary areas of knowledge (know). Ordered by average score. The top-rated knowledge areas (average score above 4) are those related to the correct use of the language, the operation of media companies and their strategies, and sector-specific software and ICTs. This latter disciplinary knowledge seems to indicate that technological knowledge begins to take centre stage in the advertising sector, which is a logical result taking into account the aforementioned digital context. The lowest ranked knowledge areas (average score under 3) is related to the knowledge of the media, which is unexpected given that advertising is included in the field of communication, where the understanding of the media could be a core competence. In terms of professional competencies (know-how), as shown in Figure 2, their ranking is a little more polarised. On the one hand, most competencies have been valued with a degree of importance between medium and high (average score of 3 to 5 in the Likert scale), but on the other hand, there are up to 5 competencies that obtained a score below the average value (1 to 3 score), i.e., they are considered to be little important. Figure 2. Professional competencies (know-how). Ordered by average score. The best-rated professional competencies (score above 4) are related to the ability to learn autonomously and to adapt to changes, and to specific knowledge of the profession (design and implementation of plans, projects and communication strategies, client relationships, writing skills, knowledge of communication techniques and platforms, and information processing). It is pertinent to point out the fact that respondents consider that the most important professional competence is the ability to “learn autonomously and adapt to changes”. This result could demonstrate that the advertising sector is immersed in a process of change in which professionals assume that they should learn independently to be able to respond quickly to changes of the market and the profession. On the other hand, this result could indirectly highlight the difficulty of the higher education system in Spain to update their BA degree programmes in communication and, more specifically, in advertising, to the pace to which society is changing. All the lowest valued competencies (average score under 3) make reference to technical aspects of the field of communication, such as the treatment of special effects, sound, and light, knowledge of the functioning of the media and audiovisual productions. All of these professional competencies refer to tasks that tend to be performed by technicians in the sector, since they require very specific knowledge of a particular area. Thus, respondents seem to prioritise the most strategic or generic competencies of the sector. With regards to academic competencies, all of them have been valued positively, with average scores between 3 and 4 on the Likert scale (i.e., they are considered Moderately Important and Important for respondents). This result seems to indicate that this type of competence has a high degree of acceptance among respondents. Figure 3. Academic competencies. Ordered by average score. 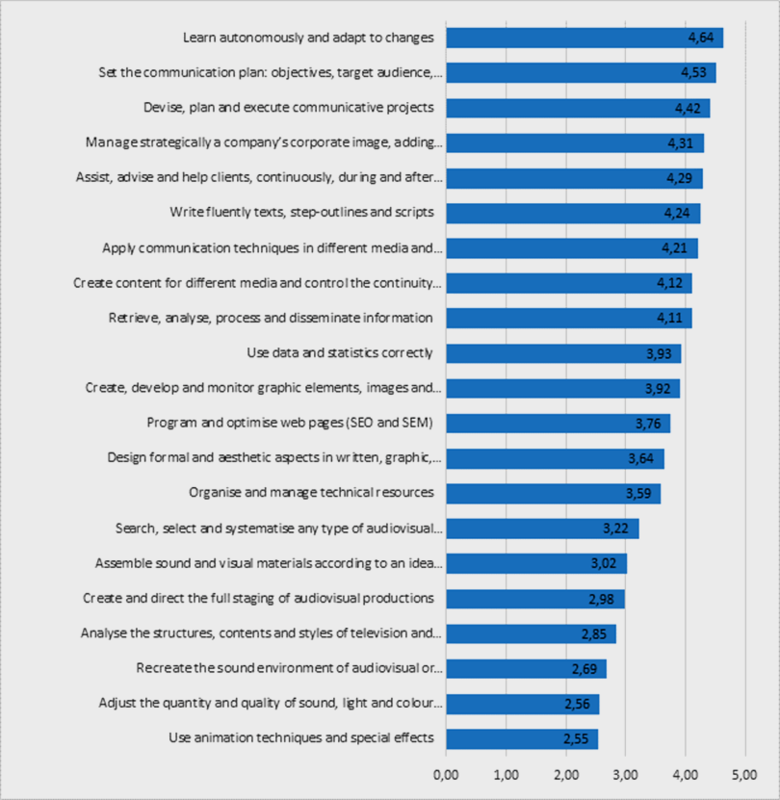 As shown in Figure 3, the highest valued academic competencies (average score above 4) are related to information search and management in a digital environment, communication skills, adaptability, leadership competencies, critical thinking and the ability of understanding and associating ideas. The fact that the best valued academic competition is the “Ability to search and manage information in a digital environment” confirms the fact that the advertising professionals are currently working in a purely digital context, and to develop their profession they need to know and master the environment. Finally, specific competencies have not only been valued positively in full but also, by group of competencies, are those that have obtained a more homogeneous score (average score greater than 4 in all cases). This means that respondents consider them between moderately and very important for the exercise of their profession. Figure 4. Specific competencies. Ordered by average score. As Figure 4 shows, this group of competencies considers aspects related with (in order of priority): team work (best valued competence, with an average score of 4.66 points), capacity for critical analysis, synthesis and judgement, ability to adapt, efficient time management, decision taking, insight, inventiveness and creativity to find effective solutions to new problems, capacity for self-criticism, ethics and professional responsibility, ability to diagnose, communication skills, interdisciplinary knowledge and “equality awareness of individuals, peoples, cultures and respect for international human rights.”. Thus, the two less valued competencies are related to tangential and theoretical aspects to the exercise of the profession in communication. Although these results show the general trend in terms of competencies, the particularities of each group of respondents are not observed. The preferences of each group in each of these four groups of competencies are reviewed next. The results are expanded and contextualised with the information collected through the interviews. Table 1. Average score assigned to each disciplinary knowledge by group. Learn about the economic and social aspects of advertising and public relations companies: labour relations, legal, fiscal aspects, financing, market. Capacity to apply properly native languages and the English language to the sector. Knowledge of the ethics, professional deontology and legal framework of the sector. Knowledge of the sector’s research and analysis methods and techniques. Knowledge of the evolution and social impact of contemporary ICTs. Knowledge of the methods of creative thinking (schools, methods and techniques), message-creation processes and their analysis. As we can see in Table 1, the highest ranked disciplinary area of knowledge among professionals is “Capacity to apply properly native languages and the English language to the sector”, followed by “Capacity to evaluate the corporate state of an organisation and design communication strategies”. On the other hand, the highest ranked disciplinary knowledge among academics is “Capacity to evaluate the corporate state of an organisation and design communication strategies”, followed by “Knowledge of and capacity to apply sector-specific software and new digital technologies”. “Among the new capabilities I would include to continue being strategic, reviewing content strategies, but also working online and offline communication in a coordinated way.” (Interviewee #2, University professor and administrator). However, the surveyed professionals put this disciplinary knowledge above the correct use of native languages and the English language, which is also a key knowledge for the professional exercise of the communication professional. The same interviewee also mentioned he completed a postgraduate course in user experience, because for him this is an approach increasingly present in any digital project. The surveyed professionals and academics agree that the disciplinary knowledge of least importance is “knowledge of the history, evolution and social relevance of photography, cinema, radio, television and the Internet”, followed by “Knowledge of the historical evolution, psychological communication processes, theories and models”. The surveyed academics also consider as little relevant the “knowledge of the economic and social aspects of advertising and public relations companies: labour relations, legal, fiscal aspects, marketing and finance”, and the “Knowledge of the methods of creative thinking (schools, methods and techniques), message-creation processes and their analysis”. Thus, both groups consider that there are other areas of knowledge that are more important than those related to the history and theories of communication. Given this result, we can sense a tendency to understand advertising in a professional manner rather than as an object of theoretical study. Table 2. Average score assigned to each professional competence by group. With regards to professional competencies, Table 2 shows how both surveyed groups coincide in their scores. On the one hand, the most valued competencies are: “Learn autonomously and adapt to changes,” and “Set the communication plan: objectives, target audience, strategies and budget control”. The group of professionals valued a little higher the capacity to learn autonomous and adapt to changes (an average of 4.64 vs. 4.57 among academics), which was expected bearing in mind that, as mentioned, there is some perception that university education in the field of advertising is insufficient and that part of the learning must be assumed by individuals autonomously. As we can see in the interviews, in most cases the updating of professional profiles to adapt to the changing environment is perceived as a completely personal aspect, and the role of professional training and higher education in Spain is ignored. Unfortunately, there is no information on whether this perception is due to the inefficiency of the education system or due to other reasons. The competence related to the communication plan is in line with the disciplinary knowledge “Evaluate the corporate state of an organisation and know and design communication strategies”. Thus, it can be considered that for the respondents the assessment and design of communication strategies are basic competencies for the practice of advertising. The two groups also agree on what are the least important competencies. On the one hand, we have “Adjust the quantity and quality of sound, light and colour during the production process” and “Use animation techniques and special effects”. As mentioned, these are technical competencies, so specific that they are often needed in very specific moments of the professional routine and for which there are other specialised professional profiles, not necessarily with training in advertising. Table 3. Average score assigned to each academic competence by group. As shown in table 3, the two surveyed groups differ with respect to what are the most important academic competencies. Unlike the highest ranked competencies, there is consensus across the groups with regards to what are the least important competencies for the exercise of the profession. Professionals and academics consider that the competencies “Knowledge of theories, methods, languages and problems of audiovisual communication” and “Knowledge of the didactics of the disciplines of information and communication” have a medium degree of importance (scores around 3 on the Likert scale). As mentioned in the introduction, there appears to be certain reservations regarding those competencies related to the theoretical content of the profession, although this suspicion is relative, since the valuation of these competencies is slightly positive. Table 4. Average score assigned to each specific competence by group. Even though the group of specific competencies has obtained the highest evaluation as a whole (all with an average score above 4), as we can see in table 4, the groups of respondents differ on what are the most important competencies. On the one hand, for professionals the most important competencies are (in order of priority): “Capacity to work in a team in different environments, communicate personal ideas and become part of a common results-based project, without losing autonomy, preserving one’s own identity and values”, followed by “Knowledge of how to manage time and organise tasks”, “Capacity to adapt to technological, business and organisational changes”, “Capacity to make decisions in situations of uncertainty, assuming risks and responsibilities” and “Capacity for critical analysis, synthesis and judgement. Knowledge of how to relate causes and effects”. On the other hand, for academics the most important competencies are (in order of priority): “Capacity for critical analysis, synthesis and judgement. Knowledge of how to relate causes and effects”, and “Insight, inventiveness and creativity to find effective solutions to new problems”. Thus, they agree on the first competence with professionals, and also add creativity, which is the typical characteristic of the sector. 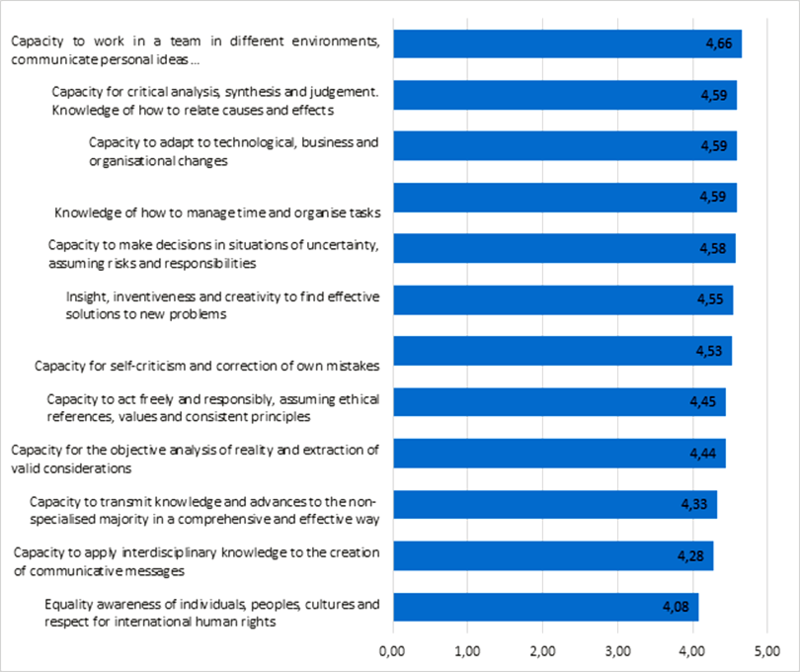 In terms of the less important competencies for professionals and academics, the two groups agree that “Equality awareness of individuals, peoples, cultures and respect for international human rights” is the least important competencies (although it has a score of around 4 on the Likert scale), followed by the “Capacity to apply interdisciplinary knowledge to the creation of communicative messages” for professionals, and the “Capacity to act freely and responsibly, assuming ethical references, values and consistent principles” for academics. In fact, none of these competencies appeared as important in the interviews. After having presented the results and addressed the three research objectives of this article. We have explored what are the current most in-demand competencies in the sector, as well as the preferences of the two surveyed and interviewed groups: professionals representing the professional sector, and academics on behalf of the academic sector. These preferences have also been linked to factors such as the technological environment and the Spanish higher education system. The results of this study show similarities to those obtained in previous research in this field, which would add credibility to the results, although there are also some differences. To begin with, a study carried out by Perlado Lamo de Espinosa and Rubio-Romero (2012) shows that the most in-demand competencies among employers in the communication sector match those that obtained higher scores in the two groups studied in this research: an analytical and strategic insight, the ability to adapt to the environment, flexibility, the ability to manage time correctly, teamwork skills, and capacity for oral and written communication in native and English languages. However, in the areas of marketing, advertising and public relations, for employers the key competencies are those related to online marketing, computer graphics, software such as Excel, photography, graphic design, page design, pre-press and strategic planning processes. As we have seen in this research, these are very specific competencies which generally have a relative weight with respect to the overall results since they are expected to be assumed by more technical profiles (except for the case of strategic planning, whose importance is highly ranked by the groups of the sample). Something similar occurs in the study of Correyero Ruiz and Baladrón Pazos (2010), which identifies analytical ability, leadership skills, communication skills and creativity as core competencies, but also demands a deep knowledge of the Internet, mastery of 2.0 tools and knowledge of different channels, SEO skills and interest in the behaviour of internet users. In this case, however, we see that the new competencies are not so technical (although they are specific) but are related directly to the need to respond to an essentially digital environment, and this has been identified in the present research, especially in the interviews. This trend is also found partially in regional case studies. For example, a study of Basque professionals (Monge Benito & Echebarria Gangoiti, 2016) indicates that creativity and strategic planning are competencies that have retained their great importance over time, but that in the last 6 years there has been an increasing interest in competencies related to digital marketing. In fact, this is the main area of expertise in which Basque professionals intend to develop. This is not the case of the study carried out by Col·legi de Publicitaris i Relacions Públiques de Catalunya (2016), which found out that among the competencies expected from professionals from the sector those related to the digital environment and ICT do not stand out, but still include timeless and specific competencies in the profession, such as: capacity of adaptation, reaction and proactivity, creativity, ability to communicate orally and in writing, and capacity for teamwork and organisation, among others. There are also recent studies that focus on the demand for competencies in specific professional profiles, like the communication manager (Perlado Lamo de Espinosa et al., 2015; Sotelo González, 2016), and creative director (Perlado Lamo de Espinosa & Rubio-Romero, 2015; Toledano Cuervas Mons et al., 2016). Despite these are more specific enquiries, the competencies related to the communication strategy, creativity, analytical capacity and knowledge of the digital system and technology emerge once again. A key result in this article is the prioritisation given to the professional competence “Learn autonomously and adapt to changes” in both groups, which was also detected in similar studies. The rise of this competence could be due to the changing digital environment, the economic crisis and, even, as a result of the new European Higher Education Area (EHEA), because as Castelló Martínez (2012) points out: “The EHEA places much more importance on self-learning, self-employment and the use of information and communication technologies, promoting the “learning to learn” (p. 5). Whatever the case, the demand for communication professionals to receive continuous training seems to be consolidating, since a changing environment implies continuous recycling (Sotelo González, 2016; Toledano Cuervas Mons et al., 2016). This result is related to a debate present in the current literature on whether the sector is moving towards extreme specialisation (Del Río Pérez & Kaufmann, 2014; Schultz, 2016) or towards more general professional profiles (Soler Rojas & Aguilar Gutiérrez, 2009; Sotelo González, 2016; Toledano Cuervas Mons et al., 2016). In fact, this controversy has already appeared in an indirect way in some of the interviews. Whatever it is, in both cases it becomes evident that professionals need to acquire new knowledge and competencies to deal with the digital environment. To conclude with the discussion of the results, and despite the constraints of the inductive method used in this research and in the study by ANECA (see Bolívar, 2008), this research opens the door to future research. On the one hand, and following the line of ANECA, it would be interesting to include a group of students to see what relations exist between their preferences in competences and the preferences of the other two sectors studied here -professional and academic-, as well as the digital context in which the sector is submerged. In addition, it would be a key group to analyse the level of updating of BA degree programmes in advertising and public relations in Spain. On the other hand, surveys have shown that, especially when we talk about competence, the capacity to “learn autonomously and adapt to changes”, both professionals and university faculty and managers often make reference to the personality and motivation of individuals. This denotes a lack of emotional competence (both personal and social) in the sample. Some social competencies appear indirectly through other competences under study here, such as communication skills, teamwork, negotiating skills, stress tolerance, and leadership, but there are others that are not referenced to directly, such as empathy, assertiveness, and the ability to influence. Personal competencies such as self-control, self-awareness, self-motivation, self-reliance, self-esteem, and self-regulation are neither mentioned, except for the capacity of adaptability. In line with the work of Del Henar Sánchez Cobarro and Peña Acuña (2016), it would be desirable to study this type of competencies specifically in the advertising field. The emergence and consolidation of the Internet and ICTs has completely changed the advertising industry, from both the communicative and organisational points of view. Albeit with difficulties, the group of professionals seems to be more quickly adapting to the new demands of the industry, but the group of university faculty and managers seems resistant to change, which affects the entire labour system in this sector. In Spain, BA degree programmes in advertising and public relations are based on the guidelines set by ANECA in 2005 but given the social and technological changes of the last few years, it is evident that it is necessary to review the status of the specific competencies in the sector and determine what new competencies have emerged. To do this, it is necessary to study the two key groups in this process: professionals on and academics. The results show that the two groups agree on what are the most important disciplinary knowledge areas: those related with the ability to diagnose the communication needs of a corporation and design communication strategies consistent with these needs, which are characteristic and timeless competencies of the profession. Knowledge of specific software and new ICTs has proved to be valued as more important by academics than by professionals, which is surprising considering that the demand for new competencies comes from the latter group. The emergence of this disciplinary knowledge reopens the eternal debate on whether the advertising industry is moving towards extreme specialisation or transverse professional profiles, although the results of this study seem to point towards the second option. Both groups consider that the least important areas of knowledge are those related to the history and theories of communication, which reflects a tendency to understand advertising in a professional manner rather than as an academic discipline. On the other hand, interviewees stated that much of the contents learned during the bachelor’s degree are of this type, and that they do not perceive them as functional. In terms of the professional competencies, both groups agree on the importance of autonomous learning and the capacity to adapt to changes, which could be provoked by the immersion of the sector in a changing digital environment yet to be fully understood. For interviewees, this competence tends to be associated with motivational and personal aspects as if the need to adapt to this new environment were a personal choice and not a deficiency of the Spanish higher education system. The competencies related to strategic communications planning and client relationship, which are characteristic of the profession, and therefore timeless, are also positively valued. The least valued professional competencies are technical in nature, and so specific that they are often needed at very specific times of the professional routine and are associated to other specialised professional profiles and not necessarily with training in advertising. In terms of academic competencies, professionals value more the competencies related to the expertise and control of the environment, which has been defined as digital, changing and complex, while academics consider as more important those competencies related with communication skills and associative thinking, which are characteristic of degrees in advertising and public relations. Unlike the highest valued academic competencies, there is consensus among the surveyed groups regarding what are the least important competencies for the exercise of the profession: those related to the theoretical content of the profession, which is in line with the results obtained in disciplinary knowledge. The specific competencies have been valued very positively by all the respondents (all with an average score above 4), and interviewees stated that all of these competencies were acquired during their BA programme. This indicates that the connection between company and university is not at all diminished, although this does not imply that the degrees in advertising and public relations should not be updated. These results confirm the fact that the industry is changing and that there are some competencies that take more prominence in an environment marked by uncertainty and new technologies, which should be translated somehow to the Spanish higher education area. * Funded research. This article is the product of the teaching innovation project Avaluació i reestructuració dels estudis en comunicació de la Universitat Pompeu Fabra (2014EMQE2 007), funded by the Agència de Gestió d’Ajuts Universitaris i de Recerca, within the call Projectes estratègics de millora de la qualitat, l’eficiència i la internacionalització. * Thanks. Cristina Sánchez-Sánchez is beneficiary of the University Faculty Training Scholarship (FPU15-00169), granted by the Spanish Ministry of Education, Culture and Sport (MECD). Almansa Martínez, A., & Godoy Martín, F. J. (2012): "El Community manager en las principales empresas de España: una aproximación a su formación y su situación laboral". Estudios Sobre el Mensaje Periodistico, 18 (Especial octubre), 57–65. ANECA. (2005): Libro Blanco. Títulos de Grado en Comunicación. Barcelona. Bellón Rodríguez, A. & Sixto García, J. (2016): "Dircom y Community Manager: dos perfiles profesionales de la mano en la comunicación organizacional". En M. Perlado Lamo de Espinosa & C. Cachán Alcolea (Eds. ), Competencias y perfiles profesionales en el ámbito de la comunicación (pp. 13–24). Madrid: Dykinson. Bravo, J. & Madinaveitia, E. (2015): "La Publicidad en 2014: Transformaciones ante el reto digital". TELOS, (99), 56–63. Castelló Martínez, A. (2010): "Una nueva figura profesional: el community manager". Pangea: Revista de La Red Académica Iberoamericana de Comunicación, 1, 71–97. Corredor, P. (2011): "En clave digital: Nuevos profesionales en Publicidad". TELOS, (87), 97–100. Corredor, P. & Farfán Montero, J. (2010): "Demandas y formación: Nuevos perfiles profesionales para la Publicidad en España". Pensar La Publicidad. Revista Internacional de Investigaciones Publicitarias, 4(1), 96–115. Del Henar Sánchez Cobarro, P. & Peña Acuña, B. (2016): "Requisitos para el profesional de la comunicación: Demanda de un perfil integral". En M. Perlado Lamo de Espinosa & C. Cachán Alcolea (Eds. ), Competencias y perfiles profesionales en el ámbito de la comunicación (pp. 297–308). Madrid: Dykinson. Durántez, P. (2015): "El community manager como nueva tendencia en la comunicación organizacional desde el punto de vista de dos asociaciones profesionales: Dircom y AERCO-PSM". En Campgràfic (Ed. ), El nuevo diálogo social: Organizaciones, públicos y ciudadanos. (pp. 191–206). Valencia: Campgràfic. Fernández-Cavia, J. & Sánchez Blanco, C. (2012): "Retos de la profesión publicitaria: aportaciones desde la planificación estratégica". Zer, 17(32), 51–71. Fondevila Gascón, J. F., Santana López, E. & Rom Rodríguez, J. (2016): "Comparativa sobre las competencias y los perfiles profesionales en publicidad y RRPP en Barcelona". En M. Perlado Lamo de Espinosa & C. Cachán Alcolea (Eds. ), Competencias y perfiles profesionales en el ámbito de la comunicación (pp. 79–90). Madrid: Dykinson. Francés Renau, A. L. & Miquel Segarra, S. (2016): "Funciones y competencias del director de comunicación". En M. Perlado Lamo de Espinosa & C. Cachán Alcolea (Eds. ), Competencias y perfiles profesionales en el ámbito de la comunicación (pp. 181–192). Madrid: Dykinson. Garrido, P., Fernández-Fernández, P. & Baños-González, M. (2014): "Estrategias ante la nueva situación tecnológica y económica del sector publicitario español". Revista Mediterránea de Comunicación, 5(2), 91–109. Kaufmann, J. (2015): "De la publicidad tradicional a la publicidad digital. Desafíos para agencias y profesionales". En Campgràfic (Ed. ), El nuevo diálogo social: Organizaciones, públicos y ciudadanos. (pp. 549–564). Valencia: Campgràfic. Miguélez Juan, B. (2015): "La oferta formativa en Dirección de Arte en los estudios de comunicación en España". Grafica, 4, 57–60. Monge Benito, S. & Echebarria Gangoiti, J. A. (2016): "Áreas de competencia y expectativas de formación de los profesionales vascos de la publicidad". En M. Perlado Lamo de Espinosa & C. Cachán Alcolea (Eds. ), Competencias y perfiles profesionales en el ámbito de la comunicación (pp. 229–240). Madrid: Dykinson. Núñez, P., García, A. & Abuín, N. (2013): "Profesionales digitales en publicidad y comunicación. Una aproximación a las necesidades del mercado laboral". Cuadernos de Información Y Comunicación, (18), 117–187. Pérez Seoane, J. (2015): "Nuevas tendencias en comunicación publicitaria: hacia la personalización en masa". En Campgràfic (Ed. ), El nuevo diálogo social: Organizaciones, públicos y ciudadanos. (pp. 529–538). Valencia: Campgràfic. Perlado, M., Ramos Rodríguez, M. & Toledano Cuervas Mons, F. (2014): "Nuevas capacidades y perfiles profesionales en el sector audiovisual y publicitario: hacia la formación en competencias". En S. Liberal Ormaechea & P. Fernández Perea (Eds. ), Últimos estudios sobre Publicidad: De “Las Meninas” a los tuits (pp. 547–560). Madrid: Fragua. Perlado Lamo de Espinosa, M., Rodríguez Fernández, L. & Saavedra Llamas, M. (2015): "La comunicación integrada actual: formación y capacidades requeridas". En Campgràfic (Ed. ), El nuevo diálogo social: Organizaciones, públicos y ciudadanos. (pp. 41–56). Valencia: Campgràfic. Perlado Lamo de Espinosa, M. & Rubio-Romero, J. (2009): "¿Qué competencias exige el sector publicitario a los nuevos profesionales de la comunicación comercial? Un acercamiento a las actitudes y habilidades de los titulados en Publicidad". En M. Martín & A. Hernández (Eds. ), Los límites a la comunicación comercial y la comunicación comercial al límite. Reflexiones sobre los discursos, procesos y experiencias (pp. 199–213). Madrid: Asociación Española de Agencias de Publicidad. Perlado Lamo de Espinosa, M. & Rubio-Romero, J. (2012): "El comunicador del siglo XXI: Las capacidades que demandan hoy los empleadores y su relación con las titulaciones universitarias". En Actas – IV Congreso Internacional Latina de Comunicación Social. Universidad de La Laguna, Tenerife. Perlado Lamo de Espinosa, M. & Rubio-Romero, J. (2015): "Competencias, habilidades y formación del creativo publicitario en la era digital". Creatividad Y Sociedad: Revista de La Asociación Para La Creatividad, (23), 6–34. Perlado Lamo de Espinosa, M., Saavedra, M. & Rubio-Romero, J. (2016): "La formación universitaria en España dentro del ámbito de la comunicación corporativa". En M. Perlado Lamo de Espinosa & C. Cachán Alcolea (Eds. ), Competencias y perfiles profesionales en el ámbito de la comunicación (pp. 263–274). Madrid: Dykinson. Ruiz Olabuénaga, J. I. (2012): Metodología de la investigación cualitativa (5th ed.). Bilbao: Deusto. Sánchez-Sánchez, C., Fernández-Cavia, J, & Roca-Cuberes, C. (2016): "Competencias y perfiles profesionales en publicidad: hacia una reestructuración de los estudios de grado". En M. Perlado Lamo de Espinosa & C. Cachán Alcolea (Eds. ), Competencias y perfiles profesionales en el ámbito de la comunicación (pp. 55–66). Madrid: Dykinson. Scolari, C. A. (2008): Hipermediaciones. Elementos para una teoría de la comunicación digital interactiva. Barcelona: Gedisa. Sotelo González, J. (2016): "Directores de comunicación y Universidad española: ¿sintonizados?". En M. Perlado Lamo de Espinosa & C. Cachán Alcolea (Eds. ), Competencias y perfiles profesionales en el ámbito de la comunicación (pp. 309–318). Madrid: Dykinson. Suárez Rodríguez, F. J. (2016): "Los nuevos medios y usuarios en la era digital". En M. Perlado Lamo de Espinosa & C. Cachán Alcolea (Eds. ), Competencias y perfiles profesionales en el ámbito de la comunicación (pp. 319–338). Madrid: Dykinson. Toledano Cuervas Mons, F., Miguel San Emeterio, B, & Grijalba de la Calle, N. (2016): "La transformación de la industria publicitaria: nuevos perfiles y competencias del creativo publicitario". En M. Perlado Lamo de Espinosa & C. Cachán Alcolea (Eds. ), Competencias y perfiles profesionales en el ámbito de la comunicación (pp. 329–338). Madrid: Dykinson. Vivar Zurita, H., García García, A., Abuín Vences, N. & Núñez Gómez, P. (2011): "Los nuevos grados en el espacio europeo de Educación Superior. Nuevos perfiles profesionales en el área de comunicación". En J. Sierra Sánchez & S. Liberal Ormaechea (Eds. ), Investigaciones educomunicativas en la sociedad multipantalla (pp. 529–546). Madrid: Fragua. La Facultad de Comunicación de la Universidad Pompeu Fabra (UPF) te invita a participar en este estudio sobre la adecuación de competencias de aprendizaje al mercado laboral. Este proyecto está financiado por la Unidad de Soporte a la Calidad y a la Innovación Docente (USQUID) de la UPF y coordinado por el profesor Carles Roca Cuberes (carles.roca@upf.edu). Tu participación consistirá en contestar una serie de preguntas sobre las competencias de los grados en comunicación y su relación con tu situación laboral. Contestar las preguntas le llevará menos de 15 minutos. No obtendrás un beneficio directo de este estudio pero contribuirás con datos importantes para la mejora de los estudios de Comunicación, que beneficiará enormemente al futuro estudiantado y a su inserción laboral. Esta encuesta es 100% confidencial. Para proteger tu privacidad, no te pediremos datos personales. Almacenaremos los datos con sistemas de control de acceso de forma que sólo puedan ser consultadas por los investigadores de este estudio. En caso de publicar datos, sólo lo haremos de forma anonimizada. La participación en este proyecto es totalmente voluntaria y puedes retirarte en cualquier momento sin tener que justificar. 1. ¿En cuál de las siguientes áreas de la comunicación ubicarías tu actual ocupación? Puedes seleccionar hasta 2 opciones. 2. ¿Cuál es tu actual ocupación? Especifica lo máximo posible (ej. guionista de TV, estudiante de periodismo, ejecutivo de cuentas, profesor de publicidad…). 3. ¿Qué tareas realizas? Describe brevemente cuáles son las tareas que realizas más habitualmente. Actualmente las titulaciones universitarias están diseñadas en base a competencias de aprendizaje. Las competencias se dividen en 4 ámbitos: Conocimientos disciplinares (saber), Competencias profesionales (saber hacer), Competencias académicas y Competencias específicas. A continuación te pedimos que valores la importancia de las competencias de cada uno de estos 4 ámbitos. Valora el grado de importancia de las siguientes competencias para el desempeño de tu presente o futura ocupación en el campo de la comunicación. -	Conocer la evolución histórica, los procesos, teorías y modelos psicológicos de la comunicación. -	Conocer y aplicar los softwares específicos y las nuevas tecnologías digitales al sector. -	Conocer y aplicar los recursos, métodos y procedimientos para construir y analizar relatos audiovisuales. -	Conocer la historia, evolución y relevancia social de la fotografía, cine, radio, televisión e Internet. -	Evaluar el estado corporativo de una organización y conocer y diseñar estrategias de comunicación. -	Conocer las estructuras organizativas y aplicar las técnicas, procesos de creación, producción y difusión audiovisuales en sus diversas fases. -	Conocer los aspectos económicos y sociales de las empresas de publicidad y relaciones públicas: aspectos jurídicos, fiscales, relaciones laborales, mercado, financiación. -	Usar correctamente las lenguas propias y el inglés aplicadas al sector. -	Conocer la ética y deontología profesional así como del ordenamiento jurídico del sector. -	Conocer la estructura de los medios publicitarios: características, tipologías y problemáticas. -	Conocer los métodos y técnicas de investigación y análisis del sector. -	Conocer el funcionamiento de un departamento de comunicación, su dirección y gestión del conocimiento y de los intangibles. -	Conocer la evolución y el impacto social de las tecnologías de la información y de la comunicación contemporáneas. -	Conocer la estructura de los medios de comunicación y de sus principales soportes y formatos. -	Conocer las teorías sobre la publicidad, las relaciones públicas y la comunicación corporativa. -	Conocer los métodos del pensamiento creador (escuelas, métodos y técnicas), los procesos de elaboración de los mensajes y su análisis. -	Conocer los parámetros históricos, políticos, económicos, culturales y estéticos de las sociedades y su influencia en la comunicación. -	Conocer los procesos de marketing y sus técnicas específicas: posicionamiento, segmentación, procedimientos de análisis y medición de la eficacia. -	Conocer los procesos publicitarios, la estructura organizativa, el funcionamiento y la gestión de la empresa de comunicación. 5. Competencias profesionales (saber hacer). -	Recuperar, analizar y procesar información para difundirla. -	Organizar y gestionar los recursos técnicos. -	Gestionar estratégicamente la imagen corporativa de una empresa, añadiendo valor a sus productos y servicios. -	Analizar las estructuras, contenidos y estilos de la programación televisiva y radiofónica. -	Aplicar las técnicas comunicativas en los distintos medios y soportes interactivos multimedia. -	Utilizar datos y estadísticas de manera correcta. -	Programar y optimizar páginas web (SEO y SEM). -	Ajustar las cantidades y calidades del sonido, la luz y el color durante el proceso de creación. -	Escribir con fluidez, textos, escaletas o guiones. -	Buscar, seleccionar y sistematizar cualquier tipo de documento audiovisual en una base de datos. -	Montar materiales sonoros y visuales conforme a una idea utilizando técnicas narrativas y tecnológicas necesarias. -	Aprender de manera autónoma y adaptarse a los cambios. -	Crear contenido para distintos soportes y controlar la continuidad del discurso narrativo a través de ellos. -	Diseñar los aspectos formales y estéticos en medios escritos, gráficos, audiovisuales y digitales. -	Capacidad para recrear el ambiente sonoro de una producción audiovisual o multimedia atendiendo a la intención del texto y de la narración. -	Crear y dirigir la puesta en escena integral de producciones audiovisuales. -	Establecer el plan de comunicación: objetivos, público objetivo, estrategias y control del presupuesto. -	Idear, planificar y ejecutar proyectos comunicativos. -	Crear, desarrollar y supervisar elementos gráficos, imágenes o textos de un modo creativo. -	Atender y asesorar al cliente, asistiéndole de manera continuada antes, durante y después de la realización de sus acciones de comunicación. -	Usar técnicas de animación y efectos especiales. -	Identificar temas de investigación relevantes, definirlos y utilizar apropiadamente las fuentes para contribuir al conocimiento en el área de la comunicación. -	Capacidad de adaptarse a los objetivos y cultura organizacionales. -	Estructurar el conocimiento complejo de manera coherente y saber interrelacionarlo con otras disciplinas. -	Asumir el liderazgo en proyectos que requieran recursos humanos y presupuestarios, gestionándolos eficientemente y asumiendo los principios de la responsabilidad social. -	Conocer teorías, métodos, lenguajes y problemas de comunicación audiovisual. -	Entender e interpretar de manera crítica un entorno comunicativo complejo. -	Saber evaluar las producciones mediáticas. -	Conocer la didáctica de las disciplinas de la información y comunicación. -	Exponer adecuadamente los resultados de la investigación de manera oral, escrita, audiovisual o digital. -	Buscar y gestionar la información en un entorno digital. -	Capacidad para el análisis objetivo de la realidad y extracción de consideraciones válidas. -	Saber gestionar el tiempo, y organizar las tareas. -	Trabajar en equipo en distintos entornos, comunicar las propias ideas e integrarse en un proyecto común destinado a la obtención de resultados, sin perder autonomía, conservando la propia identidad y valores. -	Adaptarse a los cambios tecnológicos, empresariales u organigramas laborales. -	Transmitir conocimientos y avances a la mayoría no especializada de manera comprensible y eficaz. -	Conciencia igualitaria sobre las personas, los pueblos, las culturas y respeto por los derechos humanos internacionales. -	Tomar decisiones en situaciones de incertidumbre, asumiendo riesgos y responsabilidades. -	Capacidad de análisis, de síntesis y juicio crítico. Saber relacionar causas y efectos. -	Actuar en libertad y con responsabilidad, asumiendo referentes éticos, valores y principios consistentes. -	Perspicacia, ingenio y creatividad que permita hallar soluciones eficaces a problemas inéditos. -	Autoevaluarse de manera crítica y corregir los errores cometidos. -	Conocimientos interdisciplinarios aplicados a la creación de mensajes comunicativos. En primer lugar, agradecemos tu participación en esta entrevista. El siguiente cuestionario forma parte del estudio de Evaluación y Reestructuración de los Estudios en Comunicación de la Universitat Pompeu Fabra, producido por la Facultad de Comunicación de la UPF. El objetivo de la entrevista es conocer y localizar los principales perfiles profesionales y competencias que estarían cambiando o surgiendo en la actualidad de acuerdo a la evolución vivida por el sector de la Comunicación y las TIC. Tus respuestas son confidenciales y su uso se limitará exclusivamente al propósito de esta investigación. El tiempo necesario para contestar a las preguntas es de 25-30 minutos. ¿A qué te estás dedicando actualmente en tu vida profesional? ¿En qué líneas de investigación o proyectos profesionales estás involucrado/a? De manera general, ¿qué características consideras más importantes para el desarrollo de tu profesión? ¿Cómo traduces la importancia de dichas características en habilidades que el profesional debe tener? De entre esos perfiles, ¿cuáles crees que se estarían transformando debido a la evolución tecnológica? Consecuentemente, ¿entiendes que algunos perfiles estarían desapareciendo? ¿Consideras que los perfiles relacionados con los contenidos digitales son transversales para el desarrollo de la profesión? Hoy en día al profesional de la comunicación se le exige ser polivalente, ¿de qué manera crees que esto afecta a la especialización del profesional? Desde el punto de vista del profesional, ¿cómo crees que influye la necesidad de “estar al día” en su experiencia / nivel de especialización? ¿De qué manera percibes la situación actual de los estudios en Publicidad y Relaciones Públicas? ¿Crees que existe la necesidad de desarrollar una carrera exclusiva para estudios sobre Comunicación en un sentido genérico? ¿Por qué? ¿Consideras necesaria una carrera exclusiva para la Comunicación Digital? ¿Por qué? En general, ¿cuáles son los aspectos que consideras clave para desarrollar la profesión fuera del mundo académico? De entre las habilidades que aprendiste en el grado, ¿cuáles se demandan actualmente en el sector laboral? ¿Cuáles son las habilidades que aprendiste en el grado y que están cambiado? Aparte de estas, ¿consideras que están surgiendo o se están demandando nuevas aptitudes profesionales? ¿Cómo crees que la universidad fomenta la creación de perfiles nuevos? ¿De qué forma percibes que esto afecta a los perfiles más tradicionales? Últimamente surgen nuevas denominaciones/perfiles de acuerdo a los conocimientos relacionados con la tecnología y la digitalización, ¿cómo afecta esto a la falta de normalización en un terreno tan cambiante? ¿Qué estudios universitarios has cursado? ¿En qué organización / universidad / empresa trabajas? ¿Qué cargo ostentas en tu lugar de trabajo? ¿Cuántos años de experiencia tienes en el cargo? ¿Cuánto tiempo llevas trabajando / investigando en ese sector? Article received on 28 September 2017. Accepted on 30 January. Published on 6 February 2018.